Warning: This post is not all that high-tech, but I did have the opportunity to give an interesting lecture the other day, and I thought I would share my experiences! Our (Indiana University Maurer School of Law) Advanced Legal Research course is relatively new, so the structure of the curriculum is somewhat fluid. While most lectures cover traditional legal research topics – cases, statutes, legislative history, treaties, etc. – there was a little space in the curriculum for some alternative lecture topics. Last semester, for example, a colleague and I co-taught a lecture on free and low-cost legal research resources. This semester, I had the opportunity to give a lecture on legal research apps. And the experience was pretty terrific. We wanted to try an apps lecture given the likelihood that our students will practice in a legal world that will increasingly move to paperless. And since our vendors had mentioned that they do not teach students their apps, because they’re “self-explanatory,” I saw an opportunity for a practical, informal discussion with the students about how mobile research and mobile law practice might look. Because our class is almost entirely 3Ls, the timing of this lecture, at the end of their final semester, seemed appropriate. In this first iteration of the lecture, I kept things pretty simple, focusing on the WestlawNext app, the Lexis Advance app, the Bloomberg Law app, and the HeinOnline app. I then referred them to research guides on law apps, good law tech blogs to follow, and a few articles. As a guest lecture, there were no assignments; it was just an opportunity to provide a little advice on a subject that they were unlikely to touch on in any of their other courses. And the reaction, overall, was very positive. It’s a small course, with only fifteen students, and the majority appeared deeply engaged with the demo. The librarian in me couldn’t help but furnish them with a handout, which I limited to bulleted pros and cons lists for each demoed app, as well as a recommended readings and blogs list. I thought I would get a lot of smirks about sharing a paper handout at a lecture on going paperless, but I noticed that many of the students were jotting down notes on the handout as the lecture progressed, so in the end I was glad that my librarian tendencies had prevailed. I even had students coming up to me afterward to ask questions, not only about legal research and practice apps, but also about cloud case management software, like Clio. Having only held my position as Educational Technology Librarian for a couple of years, this positive reaction was very affirming for me – it’s so hard to exact enthusiasm from law students sometimes! My geek-out moment came at the beginning of class, when, for the first time, I used my Lightning-to-VGA adapter to plug my iPad into the classroom technology cart. As was intended, this allowed me to project my iPad, rather than having to use the document camera for the same purpose. I had seen this done in vendor demonstrations at conferences, but doing it myself for the first time was a geekily blissful moment for me! I have plans to replicate this lecture for the fall, and I hope to structure it similarly, but I would like to take it further. For instance, I did not actually show any law practice apps, such as for managing depositions, displaying courtroom exhibits, etc. We talked about them, and I showed them the page in my legal app research guide that lists several, but I couldn’t go any further in-depth without purchasing the apps, and some can be quite expensive. So for next semester’s lecture, I hope to at least find some short demos of these legal practice apps that I can show in class, or perhaps even talk to the developers and see if there is a way to get their app for free, or at a reduced rate at the very least. From the reaction I received, there is clearly interest in this subject, and the more I can show them, the better. This presentation will undoubtedly expand to other audiences as well, such as my colleagues in the library and perhaps a lunchtime brown-bag for students who are not in ALR. I might eventually do a similar presentation for the faculty as well, given how often many of them are traveling to and from conferences. I am certain I am not the first librarian to give an apps lecture, so if you have given a lecture like this and have any suggestions, pass them along! I would love to hear about what apps you have demoed and for what audience, what kind of reaction you have received, and whether you know of a strategy for procuring some of the paid law practice apps for educational purposes. Comment on this post, or contact me directly – aaahlbra@indiana.edu. Thanks! Comment on tasks when we had questions or more information. We had tried a number of different solutions, everything from spreadsheets to Google Sites, but nothing worked quite the way we wanted. We were very happy when we found Do.com. The interface was intuitive. We could login from our Google accounts. We could easily add tasks and projects using the web interface or even email. Commenting was a breeze. It was great! Not to mention free. Do.com was a Salesforce.com product. A lot of companies used it every day. But for whatever reason, it was no longer viable. Do.com was done. 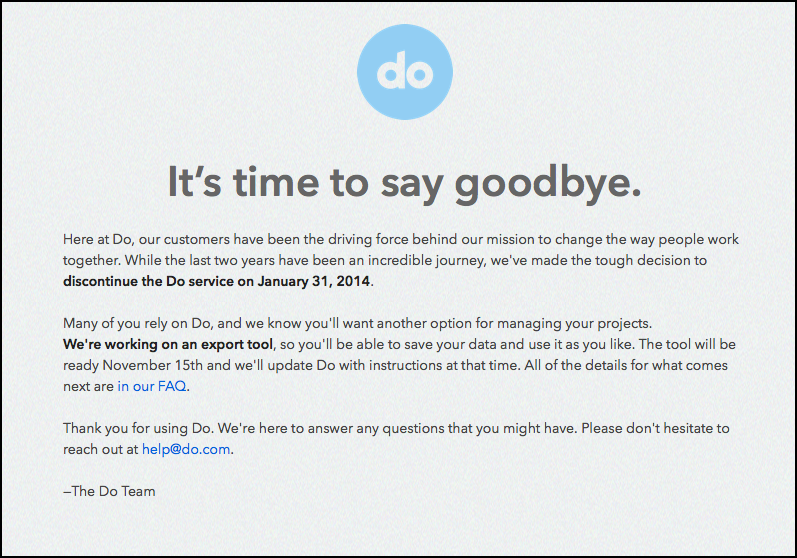 So we added Do.com to our list of services which have closed this year. Services like Xtranormal and Google Reader, just to name a couple. Back up your data — at least, what you can. Note that you may not be able to back up everything (e.g. Google Reader didn’t provide an easy way to back up all read articles). Know your import/export options. You may be able to export a lot of data, but that doesn’t mean that you will be able import that same data into other services. Read (and heed) all warnings. Most services will give you plenty of notice. Pay attention to the shutdown dates. Note that services can shut down immediately. Delete your account if you can. This can particularly important if the account has any kind of public presence (e.g. a social networking site). Of course, this assumes you were able to export all of your data. Know who provides the service. It’s not a matter of big versus small companies, but keeping track of what companies are doing. Services provided by smaller companies can shut down if the company isn’t viable. Conversely, services provided by larger companies may lose priority status and be dropped. But if you know who provides the service, you may learn about an issue with the company (such as an acquisition or merger) that alerts you to a potential problem long before the service itself shuts down. Keep an eye on development. While it may seem like a lack of new features suggests that a product is stable, it more likely means the product is no longer supported. 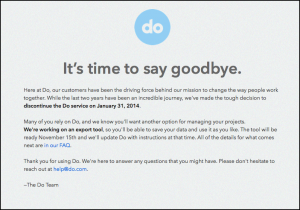 There was no new development on Do.com, for example for most of 2013 — a likely sign that Salesforce no longer supported it. Have a back up plan. No product lasts forever, so be prepared. Keep an eye on competing products. Consider open source alternatives, or even creating your own if you have the resources and skills. Regularly backup your cloud data if you can. The Library Technology Group has now moved on to a new online task/project tracker, but we know that some day (hopefully not soon), we’ll have to replace this service, too. We hope we won’t be surprised again, but no matter what happens, we have a plan in place. This post was adapted from an Ignite talk I gave to the Chicago Association of Law Librarians on November 5, 2013. Flipped classrooms – are they working? There is a need for educators of the next generation to recognize that the world that our youth currently live in is different from what it was just 10 years ago. According to Triadic Reciprocal Determinism, when an environment is changed, there is a cognitive change within the individual that follows, which in turn results in an ultimate change in an individual’s behavior. If we insist on continuing to educate the youth of today with what is often called the ‘traditional model’ of education, not only will we be unsuccessful as we implement an outdated model, we will doing a dis-service to these students due to our failure to prepare them for the future (and the present) by not providing them with experiences that utilize technology in a functional manner. The main reason that approaches like flipping classrooms are showing extreme improvements in attitudes, motivation, grades and retention, is because it is a way of teaching that is relatable, familiar and compatible to the 21st century child/teenager. Experiences like this suggest that our future law students are likely to be very familiar with flipped classrooms – something to keep in mind as we develop new ways of teaching over the next few years. In fact, our students are likely to expect them. But will flipped classrooms work equally well in law school? From anecdotal evidence I’ve heard so far, it seems that the answer is yes. Have any of you had luck – or even major problems – with flipped classrooms? And does anyone know what Triadic Reciprocal Determinism is? Wow! Look how much time has gone by since my first post this month! It’s been busy here – lots of projects to plan for, one of our librarians just had a new baby (yay!). And, after working here for 10 years, I finally have a Mac at work. So I’ve been busy running it through its paces. With so many of our faculty and students showing up with Macs these days, I wanted to know more about how they adapt to our work environment. I’ve used Macs at home since 1987, so I’m pretty familiar with the interface. But I’ve always used a PC at work. By switching to a Mac, I expect to be able to better understand how Macs can be used by law students, faculty, and staff as an ed tech tool. It’s fast. My old PC was pretty decent, but the iMac is much faster. I wasn’t expecting that. It’s bright. The screen is much nicer than my PC. I’m enjoying the crisp colors. It can do (almost) anything a PC can. The programs I use most often are Chrome, MS Office, Acrobat, MindManager, SnagIt, and Camtasia, all of which run on Macs. With Parallels, it can do everything. The only day-to-day program I can’t run on the Mac is our Voyager desktop software. With Parallels, problem solved. They aren’t (that much more) expensive. When we research new computers, we usually find that while lower-grade PCs are often cheaper, PCs with similar specs are about the same as a Mac. The Magic Mouse is magic. Its trackpad surface is easy to use and works much like a scrolling mouse, with a few extras. Why can’t I print? Mountain Lion isn’t totally compatible with our network printer/copier/fax. Our IT people had to work pretty hard to get it to connect. Where is my network drive again? I have to manually add our network drives when I want to access them (maybe there’s a work-around I’m missing?). What just happened? I love the mouse – except when I manage to somehow make a gesture that sends me to a random program or widget. I think this issue is special to me because I have the same problem with my home laptop. No one else I’ve talked to has this issue. I’ve only just started to see how far I can push the Mac. I still have to learn more about some of the latest features of Mountain Lion (how well does the dictation feature work, for example?). Earlier versions of Parallels seemed slow to me. So far, Version 8 seems fine, but I haven’t used it much. We all have a list of technologies which would be great to explore hands-on, but are just too expensive to purchase or to integrate, even with the best justifications. Yet, without direct experience with the technologies, it’s difficult for educational technologies to make informed recommendations. Getting a Mac was of those rare opportunities to directly experience a technology I’d only been able to discuss in the abstract.. The other day, a faculty member asked if she should get a Mac – a question I’ve been asked fairly often. Before I got my work Mac, I could discuss the benefits of the interface well enough, but I wasn’t as sure about what day-to-day issues she might experience trying to use a Mac in our law school. Now that I have a Mac, I can give more informed answers. That said, even hand-on experience only goes so far. It turned out that not only did the faculty member want a Mac, but she wanted an MacBook Air. To go to China. I’m pretty sure the library budget won’t cover a new laptop and a trip to Beijing any time soon. With over 84 million sold in 2 1/2 years, it’s hard to underestimate the impact iPads and other tablets have had on almost everything, including legal education and law practice. According to a recent ABA survey, 33% of lawyers now use tablets for their practice, and over 90% of those are iPads. Rich McCue’s recent survey of University of Victoria law students showed similar numbers of law students using mobile technologies. Evernote – Access your notes anywhere. Great for meetings and taking notes on long-term projects. GoodReader – Read and organize just about any document. Annotate PDFs. Great for meetings and reading articles. Chrome – Don’t like Safari? Try this alternative. Skype – Instant video conferencing. TeamViewer – Control your computer from your iPad. Lili– Ok, this one’s just a first-person adventure game. But the graphics are great and the story is fun. Faculty particularly love GoodReader and DropBox. They are usually among the first apps I recommend for someone who has a new iPad. As terrific as the iPad is, it’s now “so 2 years ago.” What’s next? Rumors about the iPad mini started almost as soon as the first was launched. Many expected an announcement in September, but Apple only announced the iPhone5. But now new rumors have started, and industry experts expect invitations to go out next week for an October 17 event. If the mini is in fact announced, who knows how much greater impact it will have on lawyers and law schools? For more about iPads in law schools and in the law, see my CALI presentation from this year’s conference (video will be posted later). A few years back my employer (California Western School of Law) contracted with Mindjet to give every student, faculty and staff member access to MindManager mind-mapping software. I encouraged this collaboration as I felt the graphical qualities of mind-maps were particularly well suited to breaking down complex legal concepts into more digestible components, something our students would find appealing in preparing class outlines or studying for the bar. A mind-map is a visual representation of relationships between concepts, words and ideas (the graphic below is an example). Mind-mapping is not new: according to a 2007 Law Library Journal article, it was developed by researchers in the 1960s. 99 Law Libr. J. 175 (2007) Software and the internet have made maps easy to create in both basic text and multimedia form, and as a result mind mapping has become quite popular. Many students raved about the software. It was quite a surprise when a student actually came up and thanked us for providing the program after a training presentation. I’ve seen bar studiers thrilled with their discovery of mind-mapping as a study tool. On the other hand, it is not for everyone. A few students recoiled at the graphical qualities of mind-maps and favored ‘regular’ linear outlining. 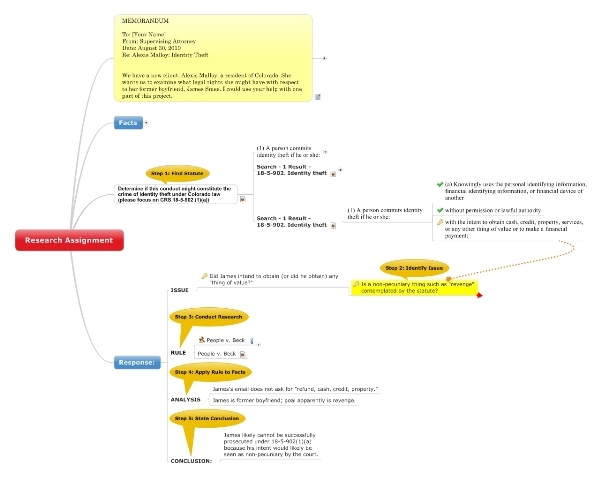 I’m not sure why the reaction for and against mind-mapping can be so strong. That sounds like a research project for an educational psychologist. However, the benefits provided to those that do respond positively have made me conclude that it is definitely worth introducing in a law school environment. Here at Boston College Law we’ve been getting a lot of chatter about backchannels and how they can be integrated into classes. While many of the examples that people are using focus on Twitter, the common concerns about privacy, anonymity, and moderation are always present as roadblocks. So, we’ve been exploring a few different tools that we’d like to pilot over the next year. So far we’ve got two possible test subjects, and we’re hoping to get more. Below is our workshop flyer we’ve been shopping around to try and drum up some new business. Remember when you passed a note to the person next to you? You may have even been caught by the teacher in the front of the room and now have an embarrassing memory. Instead of pieces of paper, students are now passing emails, texts, and instant messages back and forth during class. There is actually a name for this, and it’s not distraction, rather its backchannel. New technologies have created ways for you to interact with your students through this communication channel and could create positive participation during your lectures. We’ve been experimenting with a few of these services and found several that are easy to setup, use, and might be a perfect fit to tap into the backchannel in your classes – large or small. We’re offering a workshop in the Law Library to provide some hands-on time to try them out and discuss how these tools can help create more participation. Backchannels can add to discussion in real time, punctuate section breaks to confirm understanding, be moderated by a TA, generate review questions, encourage collaboration between students, or even carry the discussion beyond the classroom. The possibilities are endless. For your reading pleasure we’ve attached chapter one from a book entitled The Backchannel: Why are you calling me a #@*% on Twitter? In our workshop we’ll do some hands-on testing with Google Moderator, Today’s Meet, and H2O Question Tool a Berkman Center tool (similar to Backchan.nl from MIT). All free, all easy to use, and all available to you anytime. Many times we find that when we want to introduce a new tool to our faculty, workshops work best. Hopefully this will be the case with backchannel tools. So far we’ve thought of many different ways to use them for inside and outside the classroom. The voting tools like H20 Question Tool is great to get a class pulse on what the most important topics are and can allow for the discussion to continue outside of the classroom. What I’d like to know is if you’ve been playing around with any of these tools (or others), and have any stories to share?